Perfect Solutions Garage Door understands that your opener is much more than a convenience. It enhances your family’s and home’s protection. It is extremely frustrating when a garage door opener goes on the fritz. The results are usually people late for work, meetings and school. Our professional crew at Perfect Solutions Garage Door will be happy to inspect yours and repair or replace it in short order. Garage door openers are available in a range of prices with a variety of features. Before perusing those considerations, you must decide which of the two basic types of openers your home needs. These are chain driven and belt driven; however, jackshaft and direct drive openers are fairly recent developments. The chain driven models, of course, are designed with a chain which somewhat resembles that of a bicycle. This chain pulls or pushes a carriage, sometime called a trolley, which is connected to a bar made of metal. The bar is referred to as a J arm and attaches to your garage door. This produces a certain amount of noise and may not be the best option for a garage that is built under your bedroom. Newer types of chain driven openers are generally powered by DC motors and feature soft open and close technology. This makes them a bit quieter than their older predecessors. opposed to a chain, pulls and/or pushes the trolley. These opener belts are created from fiberglass, steel reinforced rubber, or polyurethane. While belt driven garage door openers are much quieter when in operation, they also cost a bit more. Jackshaft garage door openers mount differently than other systems. It is affixed to the wall alongside the garage door. It is powered by a DC motor which drives the cables and pulleys. This rotates the torsion bar to operate the door. Jackshaft garage door openers are probably the most expensive type; however, it is also one of the quietest. Many home owners say that direct drive garage door openers are whisper quiet. It is designed with only a single moving component which is the motor. This type of opener was developed in Germany and is also manufactured there. The motor moves on a chain which is stationary. The chain is implanted in a rail that is overhead. Direct drive and belt drive openers are generally available for around the same price. All garage door openers are required by federal mandate to feature a safety reversal mechanism. If the door encounters any obstacle, it should automatically stop and reverse operation directions. Garage door openers may also feature an electric eye or infrared beam. It too is designed to stop and revers, if an object interrupts the beam. Rolling Code is another great feature of garage door openers. Call Perfect Solutions Garage Door now and ask our expert team about installing an opener with the Rolling Code feature. We are here at your disposal 24 hours a day, 7 days a week. Our experienced professionals are highly trained in garage door opener repair; reprogramming; replacement; and installation. Garage Door Openers: Which One is Right for You? A garage door opener is not only a wonderful convenience, but it can increase your family and home safety. There are many types of automatic openers available on today’s market. We live in a tech world and there are many items to consider when choosing these technologically advanced products. One of the most popular types of garage openers now features a belt drive system. It is said to be the quietest and smoothest option. It may be compared to the strength of a steel belted tire which means it is capable of lifting even the heaviest garage doors. The nearly noiseless element is a big seller for individuals with garage apartments. The screw drive system of garage door openers lifts while the mechanism runs along a steel rod which is threaded. This type of garage door opener has the least amount of moving parts. A screw drive system also requires the least amount of routine maintenance. The chain drive system of garage door openers raises and lowers the door as it runs down it tracks. This is the most common door opener system and it usually costs the least amount of money. It is somewhat noisier than a belt drive or screw drive system which is the biggest downside of choosing it. A new option has been introduced and instead of a screw or chain drive, it is controlled by computer software. The unit is located directly above the garage door and is the best option for those who own garages with little head room. It is important to choose a door opener which uses the correct amount of power to lift the garage door. Even those who have a single and lighter weight garage door will be better off with a more powerful door opener as it will likely last longer. The absolute best choices are those which put the least amount of stress on the door and, of course, operate as quietly as possible. As a general rule, garage door openers which are considered high end operate the quickest. All garage door openers must be equipped with some type of auto reverse mechanism as stated by federal mandate. This ensures that it will reverse direction, should something be in its path. In most cases, this is controlled by a motion sensor. 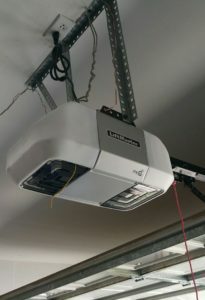 A computer controlled system can monitor and control the speed at which a garage door opener operates. A rolling code feature offers extended home security. It selects a new and the computer generates a random code every time the opener is used. This prevents thieves from hacking into the system and gaining access to the home. Garage doors also have a manual override to physically operate the door in the event of a black out. Another consideration when shopping for a new garage door opener is a single button or multi button remote operation. The multi button remotes are most often chosen by those who own a garage with more than one bay which provide access through separate doors. The best route for choosing a new garage door opener which suits your home perfectly is to consult a garage door professional and ask him/her to resent you with your exciting options.